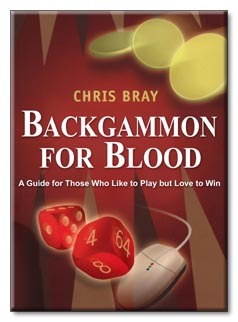 COVER: Backgammon for Blood: A Guide for Those Who Like to Play but Love to Win introduces beginners and those who haven't played for years to the knowledge and reasoning needed to play the game well. With clear, precise text and illustrations providing direction at every stage, Backgammon for Blood has everything you need to be one step ahead of the game. Backgammon is the ultimate head-to-head board gamean action-packed race to the finish with an addictive mix of luck and skill. It's easy to pick up the basics, but this is a game that continually surprisesthere's always something new to learn, and the Internet has opened up a whole other world of gaming opportunities. In Backgammon for Blood, Chris Bray, top-ranked backgammon player, reveals the tips and tricks needed to help you play the game like a pro, whether you want to make serious money in online tournaments or just play for fun at a board with friends. While backgammon can be lost or won on the throw of the dice, tactical moves and game plans can help you adapt your play to deal with whatever comes your way. With chapters on opening rolls, mid-game strategies, and races and endings, his step-by-step suggestions, sample game illustrations, and easy-to-follow text have everything you need to come to grips with the game. The different ways to play backgammonfrom tournaments and chouettes to computer and online playare all covered, as are the secrets of making the doubling cube work in your favor. Insightful and informative, Backgammon for Blood: A Guide for Those Who Like to Play but Love to Win is the ideal introduction to this dynamic and challenging game.